Preserving the blade metal is an important part of the conservation process. IF YOU ARE NOT SURE ABOUT HOW TO PRESERVE YOUR SWORD, OR FEEL THAT YOU DO NOT HAVE THE NECESSARY SKILLS TO COMPLETE THE PROCESS, ASK SOMEONE WHO DOES. This “someone” might be a fellow collector with experience of restoration, a dealer who might be able to tell you him/herself, or “knows a man who knows a man“. As time goes by, you will meet people who can offer sound advice. They will be speaking from years of experience, including mistakes that they themselves made at the start! If the restoration job is complex, it is always better to hand over your sword to an expert restorer and let them do the tricky work. Expert restorers can be found through word of mouth via dealers and collectors, and some advertise through related militaria journals and magazines. 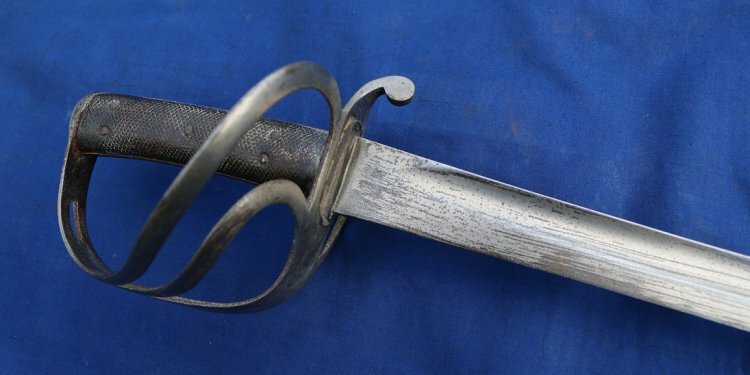 There is also a lively circle of dealers and collectors who speak to each other through internet web sites devoted to collecting edged weapons and they are always more than happy to exchange tips and contacts. You might think that after paying a considerable sum for your sword, the very last thing that you are wish to do is spend even more cash. This attitude is wrong, and if you intend to keep and preserve a fine collection of British military swords, a little extra spent on preservation will be a sound investment. Saying this, I do not mean to frighten away the collector by saying that they cannot or should not do any kind of preservation work. Far from it. An expert should normally be called in when there are complex or detailed areas of preservation or restoration work to be addressed, particularly when this might require the sword to be taken apart or broken parts to be repaired. I have visited too many auction rooms and fairs to see the results of amateur botched repairs to hilts, blades and scabbards. Here are some basic emergency procedures that are relatively simple to undertake but vital if wishing to hold back the ravages of time, and ensure that the sword does not deteriorate any further. One of the first problems that you may encounter concerns the accumulation of corrosion e.g. rust. The use of a Break Free oil which dislodges the rust is recommended, but not on blades with blue and gilt finish, as it has been known to loosen the gilding. Alcohol or kerosene is light enough to clean these delicate blades, and when completely wiped clean of this, a covering of fine carabellum wax is applied. This provides a protective seal which keeps out moisture. There are a number of specialist waxes on the market. I recommend Museum Wax or Renaissance/Becketts Wax. All these products are available from specialist hardware or gun supply shops, and a quick trawl through the internet will also locate a number of merchants who can supply mail order. Vaseline petroleum jelly or pure mineral oil/gel will also protect the blade from future moisture, but it is important to stress that you will need to inspect the sword on a regular basis to see if any rust or corrosion has returned. Some swords have very heavy areas of rust where the use of Break Free might not be very effective and other options need to be considered. In these cases, a very fine abrasive might be used, but you must decide whether the blade etching or hilt/scabbard plating might be damaged or worn by this method. It all comes down to how you want the sword to look, and there are some collectors who cannot resist removing the age or patina of a sword because they believe that a highly polished sword is more attractive. Thankfully, there are not a great number of these individuals, but you will continue to see swords that have been polished to a gleaming state and there is little you can do to return its character. Do not let this be a reason not to buy a particular sword. I would rather acquire a highly polished but rare piece, than none at all!